Q1. List the RFC 1918 private address ranges. Q2. True or false: You can use DHCP to specify the TFTP host’s IP address to a client PC. Answer: True. You can use DHCP to specify several host IP configuration parameters, including IP address, mask, default gateway, DNS servers, and TFTP server. Q3. True or false: 255.255.255.248 and /28 are two representations of the same IP mask. Answer: False. The bit-number representation of 255.255.255.248 is /29. /28 is the same mask as 255.255.255.240. Q4. True or false: Upper-layer protocols are identified in the IP header’s protocol field. TCP is protocol 6, and UDP is protocol 17. Q5. Fill in the blank: Without any options, the IP header is _________ bytes in length. Q6. The IP header’s ToS field is redefined as the DS field. How many bits does DSCP use for packet classification, and how many levels of classification are possible? Answer: DSCP uses 6 bits, which provides 64 levels of classification. Q7. True or false: NAT uses different IP addresses for translations. PAT uses different port numbers to identify translations. Q8. True or false: The IP header’s header checksum field performs the checksum of the IP header and data. Answer: False. The header checksum field only includes a checksum of the IP header; it does not check the data portion. Q9. Calculate the subnet, the address range within the subnet, and the subnet broadcast of the address 172.56.5.245/22. Answer: The subnet is 172.56.4.0/22, the address range is from 172.56.4.1 to 172.56.7.254, and the subnet broadcast is 172.56.7.255. Q10. When packets are fragmented at the network layer, where are the fragments reassembled? Answer: The IP layer in the destination host. Q11. Which protocol can you use to configure a default gateway setting on a host? Answer: B. DHCP configures the IP address, subnet mask, default gateway, and other optional parameters. Q12. How many host addresses are available with a Class B network with the default mask? Answer: C. Class B networks have 16 bits for host addresses with the default mask: 216 – 2 = 65,534. Q13. Which of the following is a dotted-decimal representation of a /26 prefix mask? Answer: B. A /26 mask has 26 network bits and 6 host bits. Q14. Which network and mask summarize both the 192.170.20.16/30 and 192.170.20.20/30 networks? Answer: C. Network 192.170.20.16 with a prefix of /29 summarizes addresses from 192.170.20.16 to 192.170.20.23. Q15. Which AF class is backward compatible with IP precedence bits’ flash traffic? Q16. Which of the following is true about fragmentation? a. Routers between source and destination hosts can fragment IPv4 packets. b. Only the first router in the network can fragment IPv4 packets. c. IPv4 packets cannot be fragmented. d. IPv4 packets are fragmented and reassembled at each link through the network. Answer: A. IPv4 packets can be fragmented by the sending host and routers. Q17. A packet sent to a multicast address reaches what destinations? a. The nearest destination in a set of hosts. b. All destinations in a set of hosts. c. Broadcasts to all hosts. Answer: B. Multicast addresses are received to a set of hosts subscribed to the multicast group. Q18. What are three types of IPv4 addresses? Answer: B. D, and E. The three types of IPv4 address are unicast, broadcast, and multicast. Answer: A, C, and D. End-user workstations, Cisco IP phones, and mobile devices should have their IP addresses assigned dynamically. Q20. Which name resolution method reduces administrative overhead? Answer: B. Dynamic name resolution reduces administrative overhead. Name-to-IP address tables do not need to be configured. Q21. How many hosts can be addressed with the following IPv4 subnet: 172.30.192.240/28? Answer: B. There are 4 bits to determine number of host addresses: 24-2 = 16 – 2=14. Q22. What is the smallest subnet and mask that can be used in a DMZ network that needs to have only three hosts? Answer the following questions based on the given Figure. 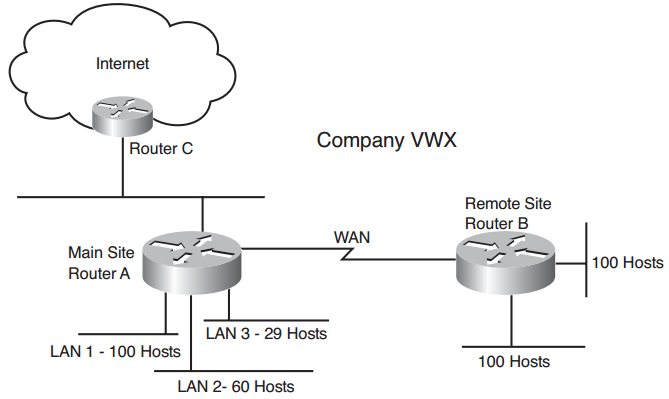 Company VWX has the network shown in Figure 8-9. The main site has three LANs, with 100, 29, and 60 hosts. The remote site has two LANs, each with 100 hosts. The network uses private addresses. The Internet service provider assigned the company the network 210.200.200.8/26. Answer: B. Answer B allows up to 6 hosts. Answer A allows only 2 hosts, which is too small. Answer C allows 14 hosts, which is larger than answer b.
Q23. The remote site uses the network prefix 192.168.10.0/24. What subnets and masks can you use for the LANs at the remote site and conserve address space? Answer: B. The networks in answer B provide 126 addresses for hosts in each LAN at Site B.
Q24. The main site uses the network prefix 192.168.15.0/24. What subnets and masks can you use to provide sufficient addresses for LANs at the main site and conserve address space? Answer: A. Network 192.168.15.0/25 provides 126 addresses for LAN 1, network 192.168.15.128/26 provides 62 addresses for LAN 2, and network 192.168.15.192/27provides 30 addresses for LAN 3. Q25. Which network and mask would you use for the WAN link to save the most address space? Answer: D. You need only two addresses for the WAN link, and the /30 mask provides only two. Q26. What networks does Router C announce to the Internet service provider’s Internet router? Answer: A. Private addresses are not announced to Internet service providers. Q27. What technology does Router C use to convert private addresses to public addresses? Answer: B. NAT translates internal private addresses to public addresses. Q28. What mechanism supports the ability to divide a given subnet into smaller subnets based on need? Answer: D. VLSM provides the ability to use different masks throughout the network. Q29. Which of the following addresses is an IPv4 private address? Answer: C. IPv4 private addresses are contained within 10.0.0.0/8, 172.16.0.0/12, and 192.168.0.0/16. Q30. How many IP addresses are available for hosts in the subnet 198.10.100.64/27? Answer: B. There are 5 host bits: 2 – 2 = 30 hosts. Q31. What subnet mask should you use in loopback addresses? Answer: D. Loopback addresses should have a /32 mask so that address space is not wasted. Q32. In what IPv4 field are the precedence bits located? Answer: C. The precedence bits are located in the Type of Service field of the IPv4 header. Q33. What type of address is 225.10.1.1? Answer: B. Multicast addresses range from 224.0.0.1 to 239.255.255.255. Q34. Which subnetworks are summarized by the following summary route: 150.10.192.0/21? Answer: D. The summary route summarizes subnetworks from 150.10.192.0/24 to 150.10.198.0/24. Answer c is the only answer that includes them. Q35. What type of network and subnet mask would you use to save address space in a point-to-point WAN link? Answer: D. Point-to-point links need only two host addresses; use a /30 mask, which provides 22 – 2 = 2 host addresses. Answer: C. DHCP assigns IP addresses dynamically. Q37. A company needs to use public IP addresses so that four network servers are accessible from the Internet. What technology is used to meet this requirement? Answer: C. Static NAT is used to statically translate public IP addresses to private IP addresses. Q38. The DS field of DSCP is capable of how many codepoints? Answer: C. The DS field allocates 6 bits in the ToS field, thus making it capable of 64 distinct codepoints.